You’ve probably seen a few television sitcoms that depict unsafe homes having 10 locks running up and down the doorway. Do you really need to have several or more locks on your door in order for you to feel safe? If you select the right type of home security door locks, you should only need one lock on your door. Sturdy home security locks are the best type to use for your outside doors. These should be deadbolt-style locks. Deadbolts provide the best method for sturdy locking of any door. Choose heavy-duty home security door locks. Don’t skimp or try to save money on this important area. Larger, thicker or heavier locks are the sign of a sturdier lock and will provide you with the ultimate in home security. Add a security chain in addition to your main deadbolt lock. Keep the chain latched when you are at home in order to provide some additional protection when you do open the door. Use a double lock method for locking the main entrances to your home. This means that you should use both the lock that is part of the doorknob (if there is one), as well as a separate deadbolt lock that is typically installed above the doorknob. Have your home security locks professionally installed. Incorrect installation can lead to problems with home security. The best home security door locks require installation by someone who has experience and the correct tools to use for proper installation. Install a peephole in your door if you don’t already have one. A peephole allows you to see out your front door before you open it. Never open your front door for a stranger. Add a security camera to your front entrance. A security camera will provide you with access to view what is happening at the entrance to your home and will also act as a deterrent for potential thieves. In addition to a security camera, add a motion sensor light. The light will go on any time someone approaches your front entrance, allowing you to better view who is there before opening the door. 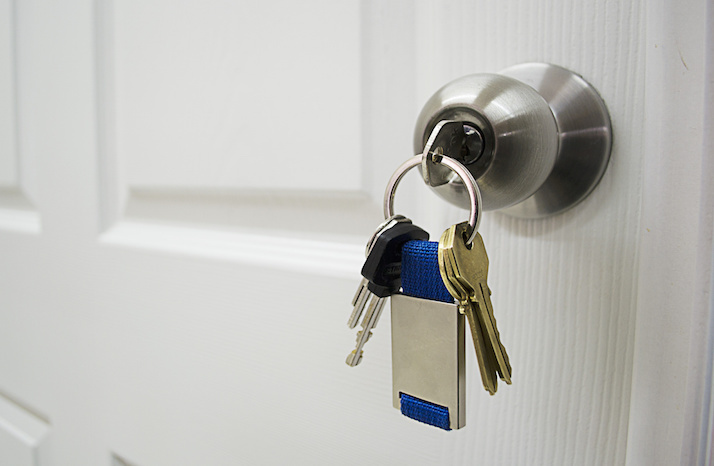 Change the locks when you move into a new home. Don’t assume that the previous owner has surrendered all the keys. Have new home security locks installed on all outer doors or windows as needed, including garage doors. Strong, thick doors, such as those made of heavy steel or solid wood, are much better than thinner. Kicking the door in is a common way for burglars to open locked doors. Putting good home security locks on your doors will protect you from possible burglaries and will give you peace of mind that you need to feel safe in your home. Use home security locks in conjunction with other security measures to ensure that your home is as safe as possible. To make sure that your home is as secure as it should be; walk around your home in both daylight and in the dark. Make notes of what areas need attention and then put some effort into adding security in these areas. Nest Cam Security Camera Review – What Can We Expect from This Number One Seller? These are very useful tips. They may seem simple and unsophisticated, but they’ve proven time and time again that they work. Having kids with me during the night makes me more careful. Our doors have security chains for added protection and I make sure the locks are sturdy. I also had security cameras installed so I could see who’s outside. We can’t take these things for granted because these are the very same things that could save our lives. Heavy duty and high quality door locks are the way to go. Intruders will have a hard time picking the locks. But I’ve done some upgrades for better protection. I actually installed digital peephole so I can view who’s at my door even without going near the door. I feel much safer that way. I believe that mixing it up by installing traditional locks and high-tech surveillance system can make our homes much safer. Thanks for these tips. I just moved into my new apartment. I never thought of changing the locks on the doors because they looked sturdy to me. Now, it all seem like a bad idea, the previous occupant might have a spare. I definitely would get that sorted out. When I moved into my new place, I ensured I changed all the locks. The front door was complete with deadbolt-style locks.As you mentioned Deadbolts provide the best method for sturdy locking of any door. The security of my front door is complete with a motion sensor activated security camera. Excellent advice. Thanks for sharing. I can’t agree with you more on not being cheap! My boyfriend got some cheap lock off eBay and the thing actually make us MORE vulnerable! Good thing no one tried to break in. His friend showed him how easy it was to open the door with little effort. It is worth spending the extra money. What is the point of getting more security on your home if you are going to be cheap about it!? When my wife and I moved into our first home in 1998, we didn’t think to change the locks. It is funny you mention that. The old owner had rented out the home prior to us buying it and I guess the tenants he kicked out were not happy. They ended up getting into our home and took a lot of our bigger items out. The neighbors thought nothing of it as they lived there for 2 years prior to us moving in. They got our TV, washer and dryer, refrigerator, my computer, and some other small items of my wife’s. They never got caught either. They fled the state. So yes, it is very important to always change the locks. We made sure to do this in our new home which we bought last fall. I put in some new locks last year on my new house and ended up getting ripped off. Avoid the cheap ones!! Not only do they damage your door but they are very easy to break through. I opted for heavy duty steel ones and the new door has a steel and bulletproof core. No one is getting through it! So needless to say I am looking into other options and I found this post very helpful. Thanks a lot! I recently installed a spot light near my house where my side door is and it has already proven to be very useful. I like all these tips. You did a great job at touching all the main factors of keeping your home safe and secure. I just moved into an apartment building and therefore did not have a choice of my lock. However, it is a really nice building and I don’t fear for my safety at all. That being said, they employ a deadbolt, doorknob lock, and the security chain which I like. Once I become a homeowner, I’ll be sure to change the locks and grab a high-end deadbolt and doorknob lock from the store. Good article, thanks for sharing! In case you live in an apartment complex or rental and do not get a pick of your home security locks here is some tips for you. You can always ask the landlord or management company if you are able to enhance your security system by changing the locks. They will typically welcome it as they are getting in improvement in their property security measures. Worth a shot if you want to change your locks for the better to feel safer. Can We Use Fake Security Cameras? The rankings you will find here at SecurityCameraSystemPro.com are unbiased and are subject to change. In order to keep this data free, we generate advertising income revenue from some of the products reviewed. Learn more here. We also participate in the Amazon Services LLC Associates program and earn advertising fees by placing links to Amazon.com.